Behold! That is what makes the heart alive, joyous and fine. The star may be unreachable to the physical hands, but the spontaneous feeling in the presence of that light, is enough to fuel and ignite the strength of our own might. Love is the force igniting all lights through the recognition of our own nature. Just like God, the inspiration is the star; but the task is to find our own light. A candle has no light, until love touches its heart. That flame becomes a light on Earth, just as the one living up in the sky. Darkness, distance and time, become the villains to overcome. But all it takes is an ignited light. A candle refrains to be ignited. The fear to be burnt alive is the mental pain and illusion stretching the distance of the path. Until the candle recognizes its nature, which is to give light. Love is that light sharing brightness and warmth to all close by. That light is just like the one of the star. What is darkness, if not the opportunity to be bright? But…How to overcome distance and time between the candle and the star? It is through that emptiness that we could recognize our own light. Acknowledge the “I” fully, just to abandon it. Find the “I” just to leave it behind. Embrace that “I” just to let it go by. It takes pure love, pure light to walk the path, of waving hello just to say good-bye. Those things, boxes, plastic bags, etc. get accumulated through time. Some things have greater priority. According to that, a personality will be built. The “I” is trying to keep everything under its 4 walls. Failing to see that those things that make up a full room now, got there not by the powers of the “I” but by coincidences, “random events,” situations, circumstances, which are the settings beyond the 4 walls of the room. Those things got into the room through “others.” To see this is to understand inter-beingness. Your “choice” is either red or blue. A person who does not know about yellow, green, magenta, etc. will believe of making a “choice” out of only 2 colors appearing in his Life, red or blue. However, it will go away. It is just a matter of time. While the box is being moved out of the room, there will be drama, struggle, fight, animosity, fear, anger, etc. After all the “blue box” is going away! The “I” may hear many talks about how “good” is to be detached from all of those boxes but once Life takes away another box from that room, the “I” will cry in despair. The box is gone! …But an emotion takes its place. As the room becomes empty of things, it does not matter how religious or how saintly someone may believe to be. The room may be empty of things, as many saints may claim: “ I do not have anything. I am not attached to no one.” However, the ghosts of emotions are taking the place of those objects. That room is not empty yet. It is full of ghosts. Self-deception is one of them. As Life removes things from the room, we may replace those objects with different ones; we may decorate that room with newness, with creativity… but we don’t. We cling to the old stuff. That is how to flush the emotions is truly necessary in the process of becoming a new person in Life. Emotions are like the odor left by the previous tenants of an apartment. That odor will spread through all new objects in the room. To be born again is to be empty, completely healed. Ready for newness. “All that you are is the result of all that you have thought,” I hear. That is not true. All that you are depends on the identification with the elements coming into that empty room. Identifying with one, surely creates a “recurrent energy,” a recurrent thought. Life itself. We are not separated from it. Once we start our “spiritual” search, the “I” is a pretty strong fellow. In awareness, we could observe how we go from one extreme into another. Yes, it is the “Black or White” mentality. Again, typically is the experience of unbearable pain, sorrow. The greater is the extent of that “I,” the greatest suffering will be experienced to break that “I” apart. At that point we may shift the blame game and we become the victim and the perpetrator at the same time. Do we see the game? If we understand this Guilt/Blame game and we could see how guilt arrives, then could we say that feeling guilty is “real”? Yes, we can feel it even though it is a ghost. The blame/guilt game is continually reinforced in our society, our beliefs and values. We may become paranoid of doing some action as that may bring guilt/blame. Moreover, even if we read this article 1000 times; it will not help us to deal with the surprising “test” from Life. Because our emotions are the ones affected and our emotions are not interested in intellectual stuff. Become aware of the emotion and release it. Let it go. That is our personal path. We may need to observe what is happening in ourselves and allow for those emotions to dissolve by itself through our own feeling of openness to “others.” It is in our relationship with “others” how we know if a recurrent energy is affecting us or not. If it has been healed or not. Observe how the emotion of anger or fear comes in. Feel how those energies will be used against ourselves, in our every day activities, which in turn will sabotage what we truly want for ourselves in Life. Allow yourself to be vulnerable and not defensive. Observe the process and be mindful of the time needed for healing to occur by itself. If you close doors that come to help you, suffering will be extended. Life has different ways to extend that help. Take it and do not judge it. Openness is the key for our perception of reality to change. That is known as forgiveness. To forgive yourself and to forgive others, is perceived as 2 different things in the “normal,” spiritual/religious use of the word. “I am so good. I am forgiving you.” Observe how insane is for you to divide yourself into 2 so you can forgive yourself. Allow for a different perception of Life to sink in. That is all. Forgiveness is to allow for a different perception to appear in your consciousness. Openness happens when there is an empty space in us available for newness to arrive. We need that emptiness. We are emptiness. That “seat” becomes empty, because an emotion /belief was released. That may be the whole magic behind the word “healing.” It is the process to emptiness. In my mind from now on, Rich is equivalent to arrogant and proud. In my heart, when I see Rich I will have developed “antibodies” towards him. “Here is the proud and arrogant individual.” Those words are not thought, they are “unconscious” but our emotions will show exactly what we “think,” or rather feel. In my inner observation, my pristine feelings will be colored by a heavy sensation, which will add up to the cloudy and foggy heaviness of interpreting and judging the participation of “others” in my life. All of those words bring certain quality of feelings, which accumulate in our beings. At the end of the day, that becomes the way we perceive the world. That is why it is said, that what is outside is inside; however as our perception refines, we could observe that there is no difference between the outside and the inside. Do you perceive hate in the environment that you are in? OK. It will go away if you become an open, empty door. Otherwise, it will be trapped in you. Any worthwhile spirituality out there will go into this with different words. If you are empty, you will not get trapped with a particular emotion or sensation. It will go through you. If you recognize that sensation or emotion as “good or bad” automatically, you will be trapped in it. Your moral values have done the judgment. What do you mean by trapped? John insulted Sue in a moment of desperation. Sue accepted the words from John and identified with them. Those words were against Sue’s own image. That was an insult! Sue reacted and insulted John back. The back and forward shows the distress of 2 egos hoping to win the war. Bothe egos are trapped into each other, until the next match. Sue will use a similar word to describe John to her friends. Stupidity becomes a synonym with the label, John. The cloudy, foggy sensation invades our pristine feelings and little by little, a wall is built to protect what we perceive to be “Me.” An Armor is born. One of the most emotional painful experiences a Life walker could feel, is when he is ready to take the armor off. That takes guts, courage and lots of patience. That is the process of openness into trusting Life again. When we become caught up in the words, we miss the experience that those words are trying to convey. Lost in words we may open a “discussion forum” to bring those “concepts” forward, without having the experience of what “holy people” and “sages” are trying to convey through dualistic words. Have you felt emptiness as an ache in the chest? Have you tried to get away from that sensation of despair of “feeling empty”? That is a sign that something is transforming. Any process of transformation requires the feeling of emptiness, but not so we run away from it or become “busy” by ignoring it; but to observe it and use that empty space to create new things. The room was full of stuff. To transform it is to empty it. Once it is empty, then we can start decorating it, creating new things. Being creative means to create from emptiness. Otherwise, we are just continuing a known theme. Many readers may not understand some of the things being shared here. These readers may “study” these words for hours, they may have all their attention into these writings and are willing to understand them… These readers are pretty intelligent as well… How is it possible for them not to understand these things? Because they may need to have am empty space in themselves so, these things could settle down. Have you ever been 100% in a religious belief? Have you ever been completely dedicated to a cause? The room is 100% full. There is no empty space there to hold anything else… anything new. All we recycle is the same thing. The same dogma. Many times if we have an empty space and still we are unable to understand, the time will come when a particular experience will allow us to understand. It is a matter of timing. That understanding is non-conceptual for it is part of our being. 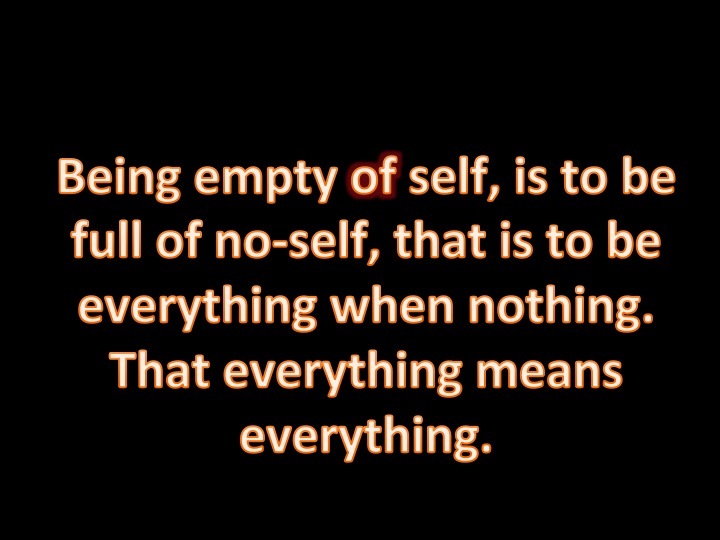 That is why it is said that when we are completely empty, we are everything. That is the paradox of being and non-being. Do we want to call that silence? Is that silence an absence of words? No. Is that silence and absence of thoughts? No. Is that silence a feeling like peace? No. That silence is an empty (silent) space in the room of the being. Unlearning has occurred and with that, the magic of transforming. As thoughts let their space for feelings to arrive, that silence is no longer an experience to talk about. It may become a room full of grateful feelings… but empty at the same time. The practical aspect of finding emptiness, voidness or any other label to describe the absence of existence of the “I” could be an experience which could start our search for meaning. It is no longer about God who is going to help “me,” because there is no “me” in that experience. That paradox is something to keep in our minds and prayers, for that speaks loudly about our own honesty. Every time we go to sleep, there is that emptiness waiting for us. Have you noticed it? That is the emptiness, which fills the self, the “I” with fear. However, when the “I” fights that natural experience, then struggle will be experienced along with suffering. When we wake up, there may be an instant when consciousness is but not a role. The role, the “this is me, don’t you remember?” happens in less than a second after that. We could not remember who we are, that is the personality; but the feeling of being there…. of existing without doubt, will be there whether we remember who we were or not. Mathias, the wise tree; was speaking with Ananda about sending feelings from the heart as a way to “help” the Totality. At the end of the road, when we have experienced every religion there is and read about every philosophy that exists, we could be full of beliefs until the final moment… but when fear of not being is transformed into embracing the experience of being who we are, then emptiness is no longer something to fear. Once we know ourselves; there is nothing to fear. The above sentence will be misunderstood or not understood by those without the experience. The drop of the water is the Ocean itself, but when the drop believes about being a drop and not the Ocean; there is fear of not existing.